Departing from a community forum to discuss the planning framework for Brisbane’s inner city, I encounter a work by Rebecca Ross occupying the windowed street frontage of The Wandering Room on a busy South Brisbane street. It’s an exhibition space for the perambulator, the browser or the passerby. In Landscape of Preoccupations, Ross has drawn on mapping conventions in a way that evokes the systematised and suggestive motifs of urban design and planning. Brightly coloured lines and shapes are assembled in a seemingly knowable order as if offering signs of the abstracted or planned city. However, with an inner logic that defies those appropriated methods, it does not readily reveal itself. As the entangled and lost gaze seeks a way through the maze, a game of lost and found ensues. My city, like so many in the world, is continuing its relentless reinvention to assert its relevance in the world. My city sometimes feels like it is suffering from planning strain – reimagined and redeveloped in ever decreasing cycles. New places are emerging from the ruins and rubble of old, while lost spaces are rediscovered. Marking and claiming territory is always a contentious practice with maps as designs for political intrigues and territorial disputes – never as seamless as the map leads us to believe. My city very much wants to be on the map and, in doing so, the terrain seems somehow ever more dissolute underfoot. Beneath this process of urban transformation, maps are re-asserted in contemporary artistic practices, appearing in public spaces as a field for questioning ideas about place and territory. It’s possibly a case of embedding yourself in place – ‘you are here’ – somehow situated in an environment that shifts and bends around us. In which case, you may well ask ‘where is here?’. To be somewhere in the ever-shifting terrain of urban geography may offer some small reassurance. However, never standing still for long, it doesn’t take much movement to be elsewhere. In Brisbane, three public space installations by Stephen Russell and Rebecca Ross address themes of psychogeography through their exploitation of cartographic sign systems, rules and assumptions. These works emerge under the rubric of a ‘neo-cartographic’ project, more focused on the map as idea, narrative or image than on landform and terrain. As the city continues to change shape, we might look to works like these to reset our compass, seeking a path through more challenging terrains. Through the Platform project, curated by the Museum of Brisbane, a series of four lightboxes situated at the bus station at the Royal Brisbane Hospital are made available for commissioned artworks. As part of the Platform Project, Russell and Ross installed works that engage with the site as one of public transit. Both artworks cause us to reflect in some way on where we are and where we are going, catalysing a momentary longing for distant destinations. On the inbound platform, Russell’s The Republic, Walden Two, The Inferno, Arcadia references the ubiquitous style of the public transport map to outline the supposed route to those powerfully mythic ‘non-places’ that comprise the work’s title. These are destinations of ideals and desires, of betterment and redemption, of creativity and imagination. They issue a warning too – one that resounds with what feels like the false promises and hollow fictions of urban planning – about the difference between the idealised and realised, about the real and the simulacra. Like Ross’ Landscape of Preoccupations, the appropriation of signs and symbols figures as an erasure of the literal and the linear, lending itself to an open-ended game of ‘losing your place’. Maps are for longing, for searching. 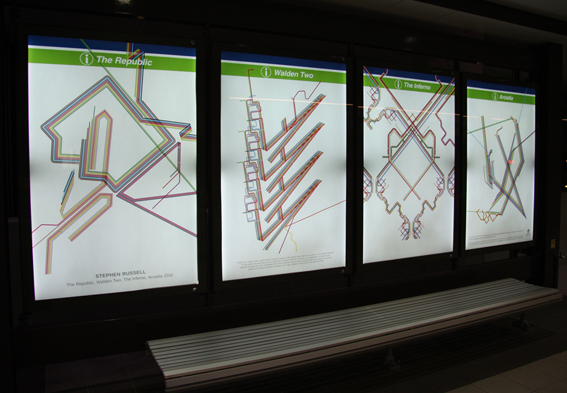 In Points of Departure, located on the outbound platform, Ross has assembled a map of maps, a world of worlds. The repeating maps incite a multitude of journeys and trajectories. It’s as if there is a world within the map and it’s as if we might venture into that world, that we might inhabit it with some part of our desire. Maps often seem like an invitation, not only inviting excited conversations about places to visit, conjuring the idyllic, but also inviting us to slip between the fine contours of topographic renderings. Browsing the shelves of the local bookshop, I am attracted to a volume titled The Atlas of Legendary Lands. Its pages reflect times when the world was so sufficiently unknown or insufficiently known, even unanticipated, that it provoked imagined and improbable possibilities of what lies beyond the boundaries of colonised or settled geographies. In the cartographies of Eden, Camelot and Atlantis, a geographic otherness is expressed and these historic and fictional narratives can lead us astray across appropriated cartographic conventions. Both Russell and Ross consider issues associated with travel and transit, and planning and place, asserting mapping as invention rather than inventory. By exploiting these mapping practices, they trigger the psychogeographic imaginary as well as pose the possibility of other spaces and journeys. In the daily life of cities, people are always on the move and always heading somewhere in the random harriedness of the streets; passengers anxiously straining to catch sight of their bus heading towards them. Looking into these works, there is the lure of other kinds of movement – of journeying elsewhere – while simultaneously straining to know our place. In tracing their pathways, we might end up in the middle of nowhere, though not before exploring that unquenchable longing to be if not somewhere then somewhere else. ← VIDEO | Are the YIMBYs here?